It has been predicted that some of the most fundamental problems in India like healthcare, food, water, and energy, are going to worsen alarmingly over the next three decades. Sure, the country has made a lot of progress over the last few decades, particularly since the economic reforms were initiated in 1991, but apparently, that’s way too little. Things have come to such that India’s most intricate issues are now likely to become almost impossible to handle unless something is done urgently. This will cause severe disruptions to lives and businesses. Maybe technology can help? India’s life expectancy currently stands at 64 years for males and 68 years for females. The infant mortality rate is 46 per 1000 live births. That’s not good enough considering where the country wants to go in the next few decades. Diseases like diarrhea, malaria, hepatitis, typhoid and even AIDS are rampant. Access to potable clean water has improved. But a 2007 Asian Development Bank study reports that no major Indian city distributes clean water for more than a few hours a day. Sanitation is also poor. As per the last study in 2008, rural sanitation coverage has reached just 21% of the population. Delivery of healthcare is obviously going to be very important to a sustainable future. And technology is making a difference here. Improved understanding of biology is leading to the development of new drugs to combat many of the killer diseases. And one part of India’s Vision 2020 Program from the Planning Commission aims to achieve this. The private sector is chipping in as well. Agencies are building networked devices for continuous health monitoring. These networked devices can bring about a revolution in treating chronic diseases by catching them early. This is what Ms. Suneeta Reddy, Managing Director, Apollo Hospitals says, “Hospitals in India want to use networked devices to monitor patients when they are away and recommend timely interventions. We are all preparing for this change now”. The food situation in India is worsening even though the country produces billions of tons of vegetables, grains and fruits. The problem is that, 40% of everything India makes never reaches the market. India wastes more vegetables than the U.K. consumes, and more grains every year than Australia produces. Yet 40% of children here remain chronically malnourished. It is really bad in some regions. For instance, in the state of Madhya Pradesh, close to 70% children under the age of five are malnourished, according to UNICEF. That’s even worse than sub-Saharan Africa. Satyajit Majumdar works as a professor of economics at Mumbai’s Tata Institute of Social Studies. Citing a report for the Wharton School at the University of Pennsylvania, Satyajit says, “Before the situation worsens and we witness a civil war, it is better to feed the hungry citizens of this country”. For India, the main problem is not in production. It is in food storing and distribution. The use of technology might be extremely useful here. Some storage facilities have no space, and thus, fruits, vegetables and grains lay scattered in gunny bags outside, under the sky. But on the other hand, there are other facilities that go empty. There is no centralized information system that tells people about the current space availability status. Technology can modernize the transport distribution system too, and this can bring down wastage as well. What’s a cause for real concern is that India is now witnessing a never before decline in crop yield, thanks to frequent extreme weather. But that problem is being addressed already. It has been predicted that genomics technologies can increase the yield between 20 and 30%. Genetic engineering can produce crops that are more tolerant to extreme temperatures. This can be a game changer in India. 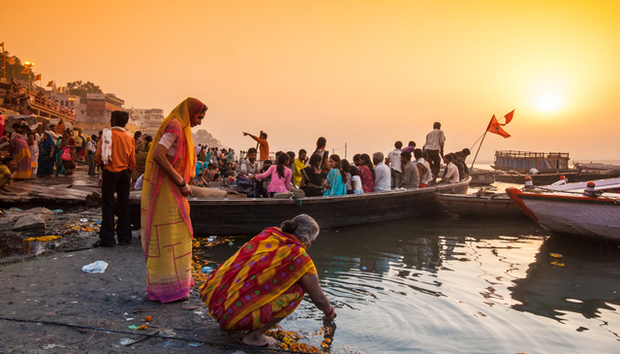 India is a country of hundreds of rivers and lakes of all sizes. There’s the Bay of Bengal and Arabian Sea on both sides. But much of India stays without safe drinking water. Consider this. About 1.8 million children in India die every year before the age of five years. Many of them are from water-borne diseases. More than 100 million people do not have access to safe drinking water. It’s worse in the rural areas. The wells and rivers are getting contaminated due to rapid depletion of the ground water table. Technology is beginning to be used to correct the situation. Water distribution has traditionally been supply-driven. That was done usually without any community consultation. But now, demand-driven approaches in rural water supply are being initiated. The Swajaldhara program gives responsibility to local rural groups. Technology solutions are monitoring the usage closely. And the focus is being directed on the cities too. Modern homes are now installing toilets that consume up to 40% less water. There was a time when India was suffering from a severe energy crisis. There simply wasn’t adequate power. Things have changed now, but the power crisis hasn’t still gone away. Energy companies are rectifying this by using technology to detect the leakage points. Improved R&D has also led to the development of better cables. And this has reduced transmission loss. This of course means that India has to produce less energy to power homes and industries. The money saved can go into replacing the old transmission cables with modern ones. There’s another problem. The cost of energy is too high. Renewable energy could be the solution, but this requires substantial re-engineering of the industries. But still, a small and gradual shift is happening. However, the real hope is in the big technology breakthroughs that can potentially change the picture entirely in India. Agencies are working on emerging grid storage technologies. More nuclear power plants are coming up even though there is political opposition to this with some support from the environmentalists. However, third and fourth generation nuclear energy solutions are certainly going to be safer and much more environment friendly. And if fusion energy becomes a reality, then that could be the thing for India. The future may look bad in India at present. But perhaps things really can change as India begins to embrace technology to solve some of its most basic problems?